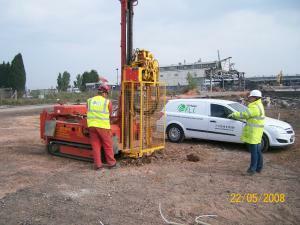 Following completion of site investigations and risk assessments by the client’s environmental consultant, VertaseFLI was employed to agree final SSTL’s and design an appropriate remediation strategy. The primary contaminants were chlorinated solvents existing as both DNAPL and dissolved phase in groundwater. Significant asbestos removal and subsequent demolition works were programmed so as to allow early access to the impacted areas. The chlorinated solvent contamination in groundwater was present in 3 distinct plumes with the confining layer typically present between 4-6 mbgl. Solvents present were Trichloroethene (TCE), Cis1, 2 Dichloroethene (DCE) and Vinyl Chloride (VC). Sparging wells with vapour recovery via specially constructed vapour recovery trenches were installed at appropriate spacing across all 3 plumes. 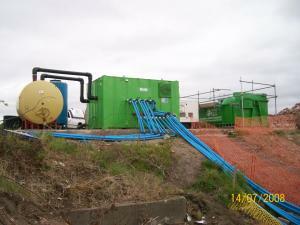 The construction programme dictated that all 3 plumes were subjected to remediation simultaneously requiring pumps and blowers of considerably larger capacity than normal. The process plant was designed, built and maintained by our own in-house mechanical and electrical engineers. The system operated successfully for 27 weeks and mobilised and recovered a significant quantity of DNAPL and dissolved phase solvents. There were two very large basements, one of which was backfilled with pulverised fuel ash (PFA). VertaseFLI agreed a blending strategy allowing this material to be retained on-site as part of the re-profiling earthworks. These works involved the cut and fill of 128,000m3 of materials including 40,000m3 of secondary aggregate produced by the demolition works. The works, which were secured under a lump sum all risk tender, were completed on time and were validated to the full approval of the regulators.